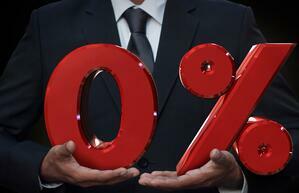 As a marketing tool, lowering fees appears to be a successful strategy for ETF providers. The largest players in the space have aggressively lowered the expense ratios on their funds to attract new investors. According to ETF.com, there are 13 ETFs that charge 0.04% and another five that charge just 0.03%. Combined, these 18 low-cost ETFs brought in $69 billion in new assets last year alone, or 22% of the industry's total $315 billion net inflows for 2018. Is zero fee better than no commission? While lower investment-related fees undoubtedly help the investor, the total portfolio cost is the ultimate consideration. This begs the question, “is a zero-expense ratio fund always better?” On the surface that question appears to have an obvious answer. But not so, when you consider trading costs. The other positive trend for ETF and mutual fund investors is the continued increase of commission-free ETFs and mutual funds on various custodial platforms. Firms such as Schwab, TD, and Fidelity are continually increasing the number of ETFs having $0 in commission costs. Currently, the zero expense ratio funds are not on any of these lists. Except for proprietary products, we assume that will continue to be the case as there is very little to no revenue available to share between the ETF or fund provider and the custodian for shelf space. Among other variables, Blueprint takes both expense ratios and trading costs into account when managing and developing portfolios. While you certainly cannot solve for every variable, analyzing the impact of each data point, particularly at the extremes, provides great insight. For example, at various account sizes with modest turnover assumptions, paying the trade fee on a low-cost ETF generates a lower total cost to the client than using a zero-expense fund with trade fees. The table below illustrates this effect. It is no surprise that trading costs have a disproportionately negative impact on smaller accounts. We can debate the turnover assumption, but factoring in rebalances, additions, withdrawals and number of holdings, eight total trades per year (four round trips) seems reasonable. What is surprising however is the idea that smaller accounts are better off paying the underlying expenses of the fund assuming, at best, the fees are less than 40 basis points. Conversely, larger accounts benefit from (by a small margin) zero-expense funds. This may not be counterintuitive, but it is certainly counter-marketing. 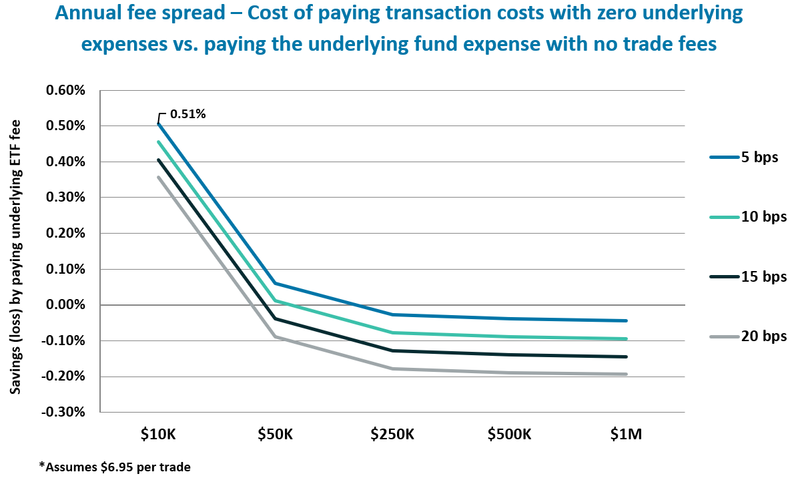 The following graph illustrates the net impact of transaction costs with zero underlying expenses vs. underlying fund expense with no trade fees at various asset levels. For example, a $10K account that pays 5 bps in underlying ETF fees saves 51 bps per year in total costs. Similarly, a $1M account remains below 0% regardless of the ETF expense, which says that it is always better to seek zero-expense funds and pay the transaction cost. The irony here, and the real crux of the issue for advisors, is this conclusion runs contrary to the marketing of robo and robo-like platforms that cater to a smaller account balance audience (see: millennials). Therefore, advisors face a marketing headwind as fees and trading costs continue to decline. This brings us back to a point that cannot be stressed enough. Advisors who are selling market returns (beta) are at risk of becoming obsolete because there are numerous options that provide the same outcome far less expensively (or even free). Building and operating a successful advisory practice is no longer solely the result of outperforming the other advisor down the street or across town. Those advisors gaining market share today focus on goals-based planning, providing the comprehensive and highly coordinated experience their clients’ desire. For all practical purposes, advisors compete globally and must justify their fees by adding value, versus the well publicized beta providers. These include the robo brands and the ever-popular do-it-yourself versions of “Vanguarding” and now, “SoFi’ing.” But free or low-cost beta is not advice; it’s a tool that helps clients achieve their goal. In the end, advisors who make the client the hero, rather than performance, and focus on adding value to their client’s financial lives, will be the winners. For more thoughts on ways to evolve your investment approach and reduce the impact of expenses and trading costs on your portfolios visit our website.